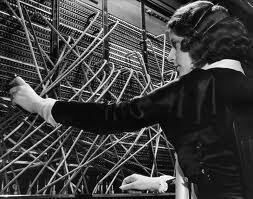 One of the realities when you switch churches and denominations is how one network of communication is unplugged and another network is connected. It takes a bit of time to find out where you are in all of this. But after having done moves to England and back again I have found that it is best to just listen to the conversations taking place in your new network for a time before you speak. But when you do be prepared for energizing dialogue and new information. My new network of reformed, confessing Anglicans is international in its reach. I have made new friends and reestablished friendships with others with whom I have been out of touch. One new friendship and I had a fascinating dialogue over a small niggle of mine: Did the Bishop of New Jersey have the jurisdiction to depose me of my Holy Orders when my Orders were conferred by the Church of England and not by the Episcopal Church? When I raised it with the then Bishop in our last, tense, interview he dismissed it out of hand. His view was simple. If I was canonically resident in the Diocese, I fell under the deposition canon in its entirety as he interpreted it and how he would present it to the Standing Committee, and that was that. And that’s where we left it. But it niggled. And when the deposition letter came signed by the Bishop’s successor the niggle just got worse. The language of the deposition itself and one of the officers in the long list of “cc’s” at the top just seemed odd to me. 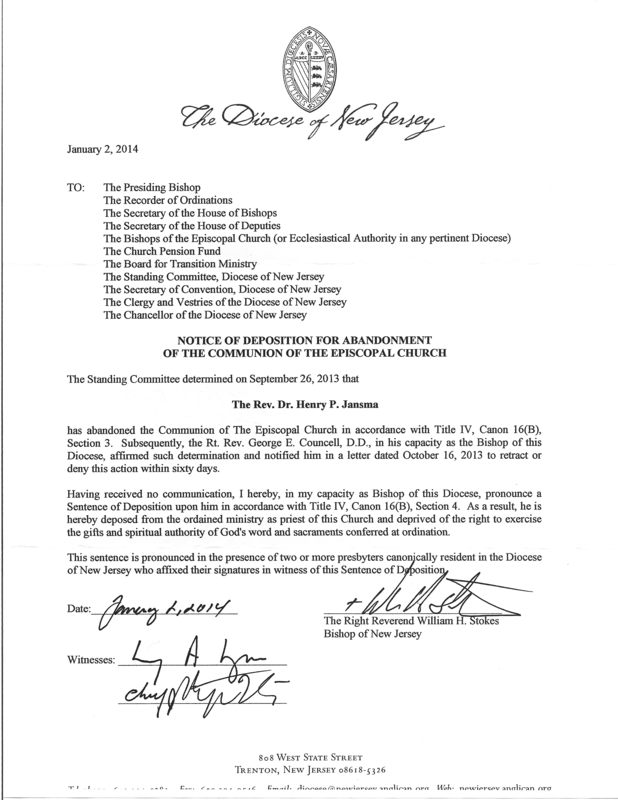 How the then Bishop of New Jersey and the Episcopal Church apply the canon is clear. In 2009 Presiding Bishop Katharine Jefferts Schori signed a letter of renunciation of Holy Orders for a Church of England Bishop Henry Scriven (Assistant Pittsburgh) using similarly quoted language from the canon in his letter as I had in mine. I tried to confirm the wording but the original statement has been removed from the Episcopal News Service website. If a Church of England bishop must fit into TEC’s Procrustean bed, where does a presbyter with a niggle go from here? Enter the new network of friends. One of them is an expert on Church of England canon law and who has served on the Church of England Synod revision committee which drew up the new Clergy Discipline Measure for the Church of England. When I asked him my question he told me that sentences of deposition were abolished in the Church of England. Holy Orders, according to the understanding of the Church of England over many centuries, can not be removed once conferred, and it only makes sense to think in terms of prohibiting someone from exercising their ministry – which is what now happens there in extreme cases and get this: do not include disagreements over doctrine. He also said that the principle is amply illustrated by the fact that a minister deposed in one province can be licensed to serve in another. Enter Article XXXVII. Article 37 of the Thirty-Nine Articles deals with the state and its civil representatives. Edited extensively when established by the Episcopal Church in its Convention of 1801, it remains unaltered in the Church of England. There is one line my expert referenced, “ The Bishop of Rome hath no jurisdiction in this Realm of England.” The Pope has no authority or jurisdiction in the established Church of England. The Bishop of the Episcopal Diocese of New Jersey and the Presiding Bishop of the Episcopal Church “hath no jurisdiction” to renounce Holy Orders conferred by the Church of England. We can be inhibited from exercising these offices or canonical residency may be withdrawn in the Episcopal Church, but no more. Valid ordinations cannot be removed.